Sometimes I work with ulterior motives. In my defense though, it’s in the name of the greater good. Or, in this case, kale chips. I’d been curious about Brad’s Raw Kale Chips for a while. Problem was, I wasn’t a big fan of the cost. So much money, and for such a little container too! Christmas came and with it, I pondered over what to get my impossible-to-shop-for Dad. So I went into the local T.J. Maxx and bought a bunch of the organic foods and unique snacks to put in a basket (great present idea by the way) and what do ya know? There was a carton of Brad’s Raw Vampire Killer Kale Chips. So I decided to go all out and buy it (I know, such a sacrifice, right 😉 ). But, my mind was already working in advance. If my dad ended up liking the chips, he might buy me some kale to make my own! (In case you haven’t picked up on it, I’ll state the obvious: I can be very cheap.) I’d have been trying to convince my dad to eat kale, but he wouldn’t because of its bitter taste (which he knew without ever trying before…?) Now, disguised as a christmas gift, he’d have to try some. Ha! Place cashews in a bowl of water and let soak for 1 hour. Afterwards, combine with sunflower seeds in a food processor and pulse until in crumb-sized pieces. Line 2 large roasting pans with parchment paper and preheat the oven to 325 degrees. 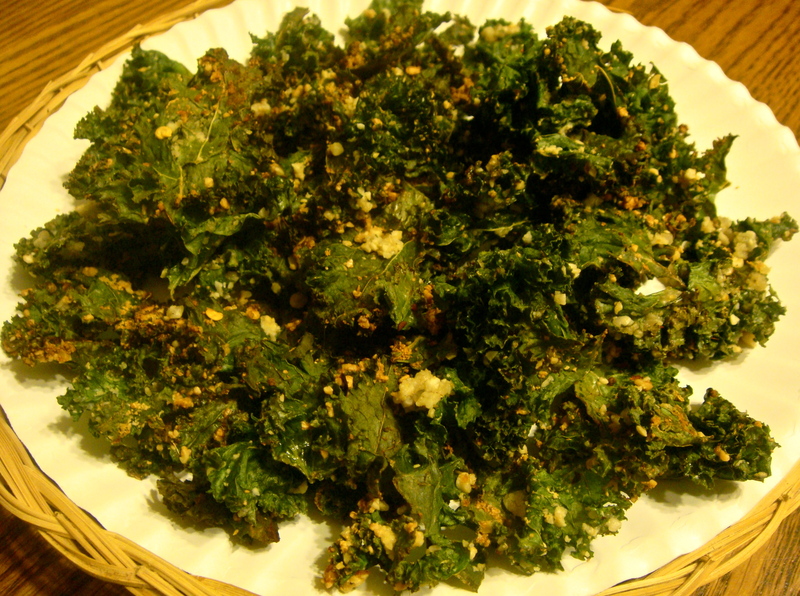 In a bowl, combine and toss kale, cashew/seed mixture, olive oil, lemon juice, garlic powder, pepper flakes, salt, and pepper. Spread out on roasting pans. Bake at for 18 minutes. Afterwards, let sit for 2 minutes to cool down and become crispy. Thanks! Haha- we share the same problem! I love kale chips and the addition of the nuts is great I think. A nice healthy snack food. This is a great blog to read and follow – I urge you to check it out. Lots of paleo recipes.